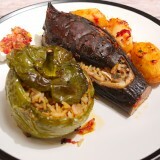 Delicious Sicilian eggplant stew full of Mediterranean aromas. 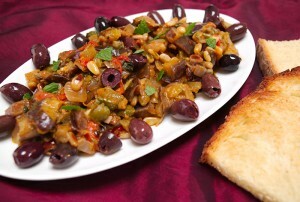 The world-famous Caponata! I realised that it’s been a few weeks that I haven’t used any eggplants in my dishes. That’s not me! The queen of vegetables has always a special place in my heart and plate! 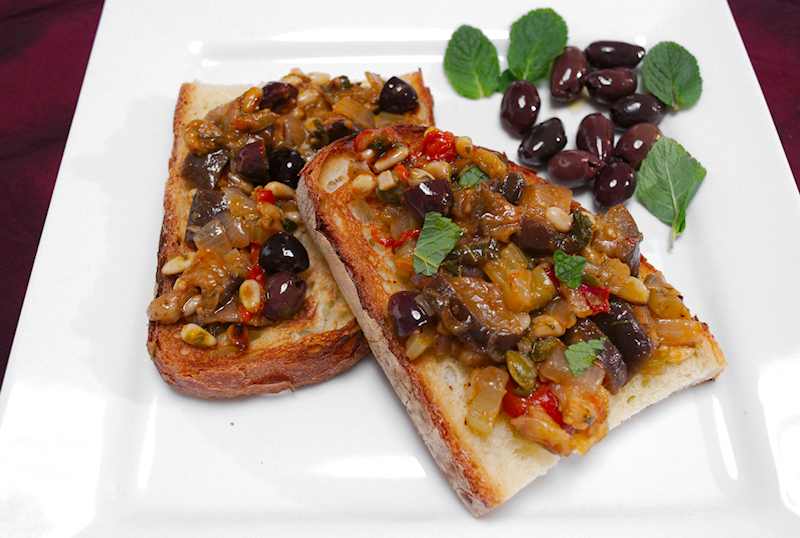 The first time I tried Caponata I was…overwhelmed! It was difficult to explain what I liked from this dish. Of course, I am familiar with stews based on vegetables and tomatoes but this one was different. 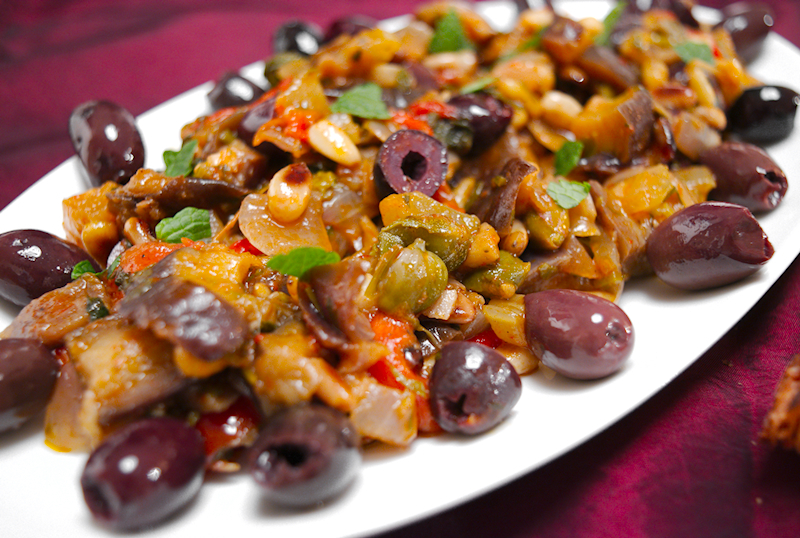 I guess what makes Caponata different is the combination of vinegar and sugar. Yes, you get that “sweet and sour” taste but not in the way a Chinese pork would do! If I had to tried it for the first time, I would be reluctant to use vinegar together with tomatoes. But I guess the Sicilians know better. 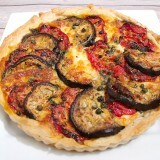 As it’s a plate that celebrates the Mediterranean seasonal vegetables, you can improvise and add whatever you fancy. Maybe some zucchini? 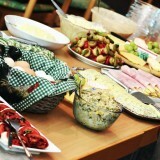 But try to stick to the basic ingredients, the eggplants, fresh tomatoes, celery and olives. Honestly, this is such an amazing meal! Make sure you make a lot of it as it can be refrigerated for a few days. Actually, it tastes better the next day. So you have your lunches sorted! 2 celery sticks finely shopped. 4 garlic cloves finely chopped. 8-10 San Marzano or cherry tomatoes cut in half. 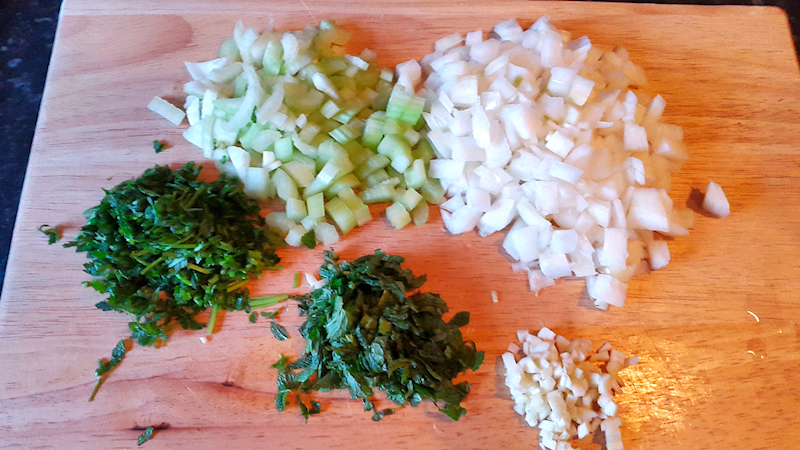 A small bunch of flat-leaf parsley finely chopped. 2-3 tablespoons of fresh mint finely chopped. 2 tablespoons of red wine vinegar. 2 teaspoons of brown sugar. ½ cup of capers rinsed and drained. 50 gr (~ 2 oz) pine nuts. 50 gr (~ 2 oz) pitted black olives. Cut the eggplants in cubes, ~ ¾ of the inch thick. Place them in a colander and add plenty of salt. Place a heavy flat object (like a soup bowl filled with water) on top and let the eggplants remove their bitter juices for ~ 30 minutes. Rinse them with cold water and dry them with a kitchen towel. Place the red pepper on a tray and bake it in a preheated oven at 190 degrees Celsius (375 F) for ~ 20 minutes until the skin starts getting black. Let it cool down a bit and remove the skin. Remove the seeds and cut the flesh in small pieces. Use a small frying pan on medium-high heat and toss the pine nuts for ~ 1 minute until they start getting brown. Remove and set aside. Add 4-5 tablespoons of olive oil in a pot on high heat. When the oil is hot, add the eggplants and fry them for ~ 10 minutes until they start getting brown. Remember to toss them from time to time so they get cooked in both sides. When ready, place them in a tray covered by a kitchen towel to absorb the excess oil. Clear the oil from the pot and add 4-5 tablespoons of fresh olive oil on medium heat. Add the onion and celery and cook for 3-4 minutes until they start getting soft. Add the garlic, parsley and mint and cook for another minute. 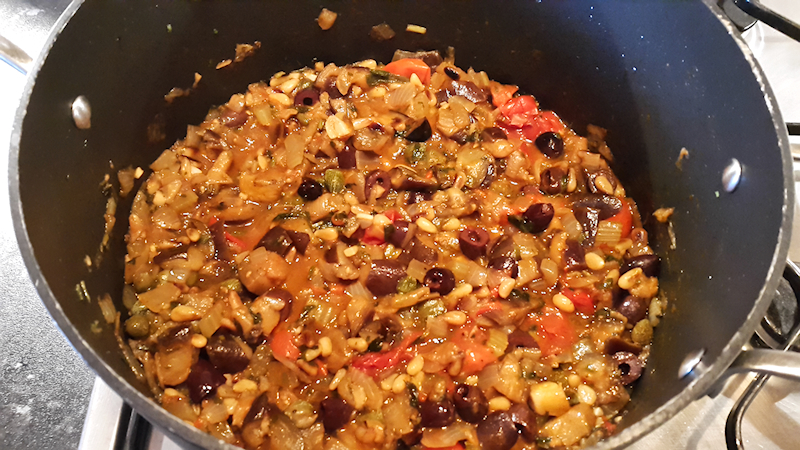 Add the eggplants, pine nuts, red pepper, tomatoes, capers, olives tomato paste and ½ cup of hot water. Season with salt and pepper to taste. Add the red wine and balsamic vinegar, sugar and give it a good stir. Reduce the heat to medium-low and let it simmer for ~ 15 minutes until the sauce thickens. Check if it needs more seasoning or sugar. 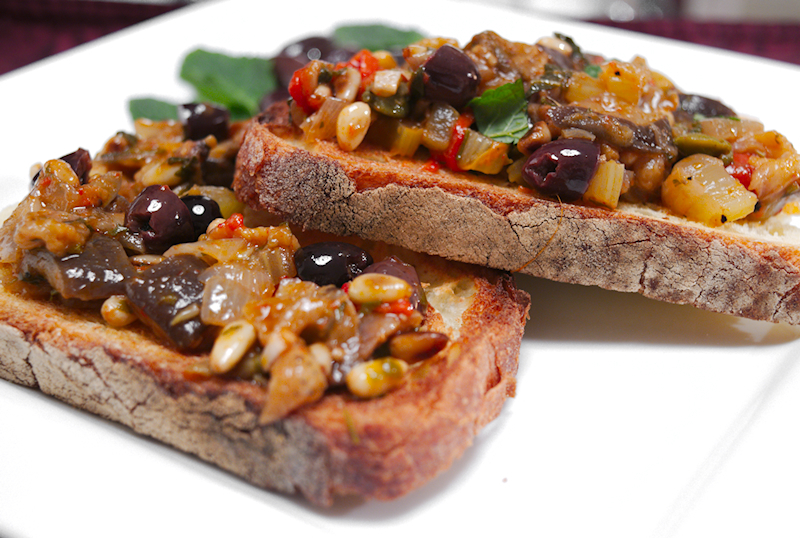 Enjoy the Caponata warm topped with fresh mint and olive oil. 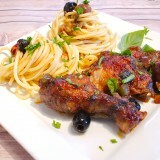 My favorite Italian food, thanks for the recipe , I can’t wait to try it. I have the eggplants now to the grocery store.